Our new Air loudspeakers were designed from the ground up to provide the best possible listening experience with both music and movies. They all feature high quality drivers and precision crossovers to deliver audiophile quality sound with amazing accuracy and very low distortion. All of our Air speakers sound incredibly good on their own, and they've been carefully timbre matched to work perfectly together. To get the best possible performance and sound quality, we recommend selecting a full set of matched Air speakers for your system, and one of our high performance XPA Gen 3 power amplifiers. For the deepest bass, and the most impressive sound effects, we also suggest that you consider one (or a pair) of our new Air Subwoofers. The Air C1 is a three way center channel loudspeaker, featuring a 32mm Air folded ribbon tweeter, a 3" woven fiber midrange, and dual 5-1/4" woven fiber woofers. The Air C1 is a perfect match for a surround sound system featuring our Air T1 tower speakers and Air E1 surrounds. Air high-frequency transducers - deliver flat frequency response, low distortion, virtually nonexistent signal Compression, smooth off-axis response, superb transparency, and uncanny imaging. 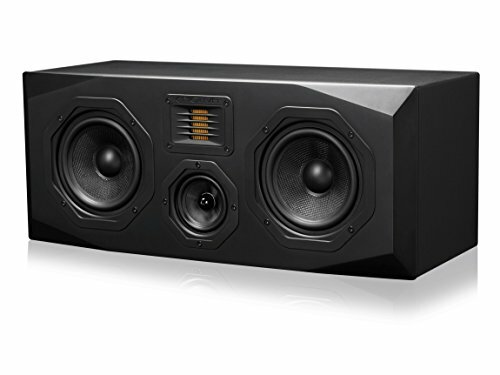 Minimum acoustic signature cabinet - the angled exterior contours on the air speakers serve to minimize diffraction effects and room interactions. Tough yet attractive exterior - several coats of satin-finish lacquer give the front bezel of the air speakers an elegant understated appearance.